RALEIGH, NC (AP) — In North Carolina’s colonial history, the best known tales concern the legendary Lost Colony of English settlers who had vanished mysteriously by 1590. Less widely known, but perhaps more significant, is a story from a few years earlier about the first science center in the New World, headed by the first known Jewish person to arrive on that land. Archaeologists plan to return this fall to the site of the science center once headed by Joachim Gans, an expert metallurgist who came to America in 1585 at the request of Sir Walter Raleigh. They’re trying to uncover more evidence of the center at the Fort Raleigh National Historic Site in Manteo on North Carolina’s coast, best known for the colonists who disappeared. On Friday, the state will honor Gans. Among those scheduled to speak is Stephen King, the US ambassador to the Czech Republic. A historical highway marker will be placed along the old US Highway 64, near Fort Raleigh, later this year. Gans, an expert metallurgist in Prague, initially came to England to help the country get more copper from its ore and do it more efficiently. When Sir Walter Raleigh sent 108 people to the New World in 1585, under the leadership of explorer Ralph Lane, he included Gans as the mineral expert. Gans’ presence helped reassure investors who were skeptical about the commercial prospects in North America because other explorers had failed to find anything promising, said Brent Lane, a former venture capitalist and economic strategist who researches the financing of explorations as the ones undertaken by Raleigh. Gans’ inclusion in the exploration also “marks the line where England was more interested in what he could contribute to the economy than holding onto religious prejudices,” said Leonard Rogoff, president of the Jewish Heritage Foundation of North Carolina and author of a book about Jews in North Carolina. Gans launched a broad program of study at the science center, including metallurgical analysis of mineral specimens; chemical analysis of botanical specimens; and cartographic studies of landforms and maritime navigation, Lane said. He and Thomas Harriot, also part of Raleigh’s scientific team, identified sassafras, an herb that used to treat syphilis, and that became a lucrative export to England, he said. Although Gans didn’t find gold, he did identify copper. And his research was enough to convince a group of civilians, who became the Lost Colony, to settle there in 1587. It also likely helped that the settlement had a high survival rate: 104 of the 108 returned to England. In 1589, three years after his return to England, Gans was charged with heresy for denying the divinity of Jesus Christ. He was jailed, and it’s not clear what happened after that. Historians assume he wasn’t executed because there’s no record of that happening, leaving open the possibility that he returned to Prague. A historian at the Jewish Museum of Prague is researching that question, and a seminar on Gans is scheduled in November in Prague. 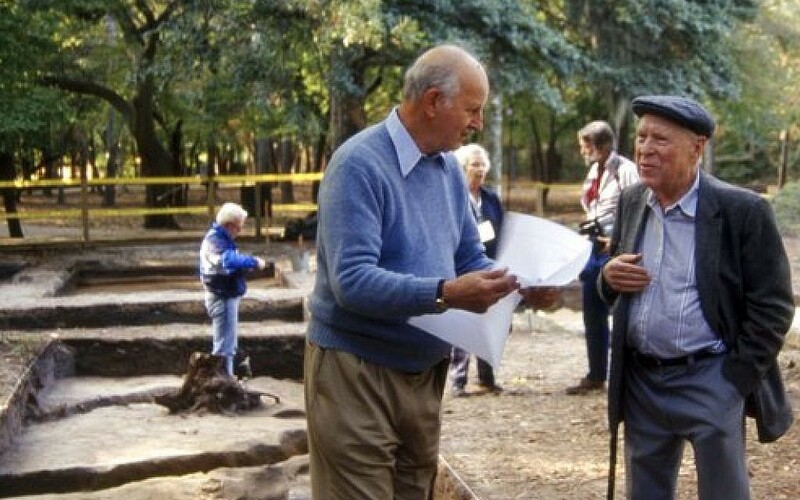 While the site of Gans’ work was discovered in the 1960s, it wasn’t identified as his science center until Ivor Noel Hume, who also discovered important artifacts at Williamsburg, Virginia, put the pieces together in the early 1990s. In the past five years, the First Colony Foundation has sponsored two other digs at the science center, said Eric Klingelhofler, a foundation board member and archaeologist who participated in previous digs. They plan to return this fall because “we can only build up the story of the First Colony (the 1585 expedition) and the Lost Colony by assembling one clue after another, he said.